The Roadrunners make their second of four scheduled visits to the Valley View Casino Center tonight, riding the tails of an 8-5 win over the Ontario Reign on Friday, the team’s eight goals scored a new club record. Since these teams last met for a pair of games to open up the campaign, the Gulls rattled off three consecutive wins until falling to the Stockton Heat in a 14-round shootout Friday. The Roadrunners are still responsible for San Diego’s only regulation losses this season. Goaltender Merrick Madsen, re-assigned by the Coyotes to the Roadrunners from the ECHL’s Norfolk Admirals this morning, is joining the team in San Diego. Adin Hill left last night’s game in Ontario late in the second period and was relieved by Hunter Miska. Laurent Dauphin registered the primary assist on Conor Garland’s game-winning goal last night and is slated to play in his 200th professional game tonight. The 23-year-old has played in 34 career NHL games, all with the Arizona Coyotes, and 165 in the AHL, 62 of which have come in a Roadrunners jersey. He has five points (1G, 4A) through the team’s first seven games this year. 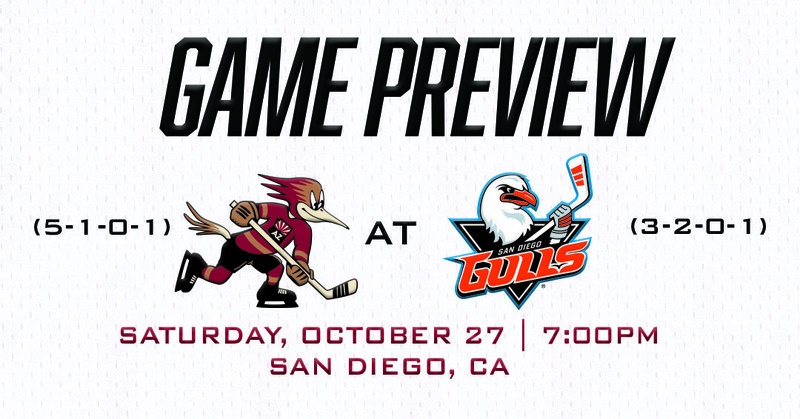 WE’VE GOT YOU: You could say, right now, that the Roadrunners have the Gulls’ number. 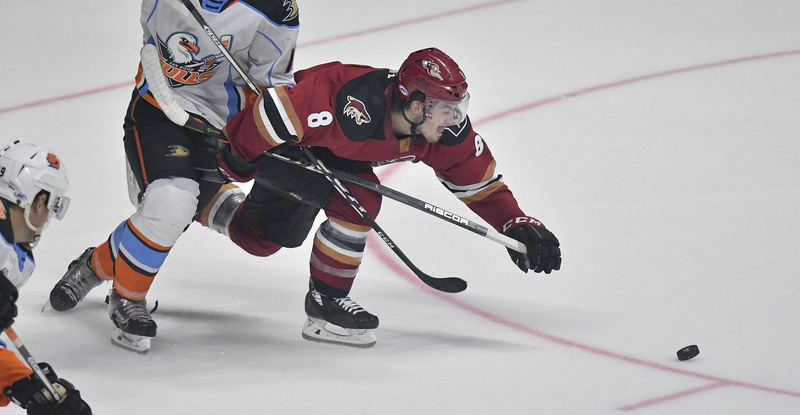 Dating back to April 11 of last season, the Roadrunners have strung together five-straight wins against their I-8 Border rival, outscoring them by a 22-11 margin during that span. Since December 27, 2017, the Roadrunners have earned points in five of their last six visits to the Valley View Casino Center, going 4-1-0-1 in San Diego’s home building during that stretch. KEMPE, RIGHT AWAY! : Mario Kempe wasted no time getting involved in the team’s scoring outburst Friday night with three assists, active in his first game back with the Roadrunners as he played on the left side of the second line with David Ullstrom and Conor Garland, a trio that combined for 10 points (3G, 7A). The three, due to their instance success with one another last night, are likely to be together again in San Diego. Kempe registered four points (1G, 3A) in three games played at the Valley View Casino Center last season. CONSISTENT CAPO: Currently with the longest active point streak on the Roadrunners’ roster, Kyle Capobianco enters the night with assists in four straight games, including two last night, one of which set up Conor Garland’s first goal. Garland, coming off of a monster five point performance (2G, 3A) Friday, enters the night with points in his last three games. FOURTY-TWO: Hunter Miska made 42 saves in his last start against the Gulls on October 12 at the Valley View Casino Center, a career-high mark as he helped shoulder the Roadrunners to a 3-2 win. He is 3-1-0 all-time against the Gulls in six appearances.